An intake plenum to allow the use of a 74mm throttle body. This intake plenum is constructed out of quality carbon fiber and nylon. It is shaped like the original plenum to insure proper fitment in the very tight Boxster engine compartment. The use of a 74mm throttle body over the 68mm original one will allow your engine to breath better. Increase in airflow by as much as 10% have been registered with this setup. 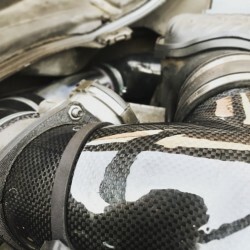 For best result, use the BAD carbon fiber intake tube and K&N drop in filter. No remap is required to use the bigger throttle body, but it is recommended if you want to reach the full potential of the setup.